Adrian Watkinson is no London cabbie, but it’s clear something’s at work as he shuffles his little car in and out of traffic along the narrow, congested streets of the city’s East End. As it turns out there’s an inherited line of “cabbie blood” in Adrian’s veins. 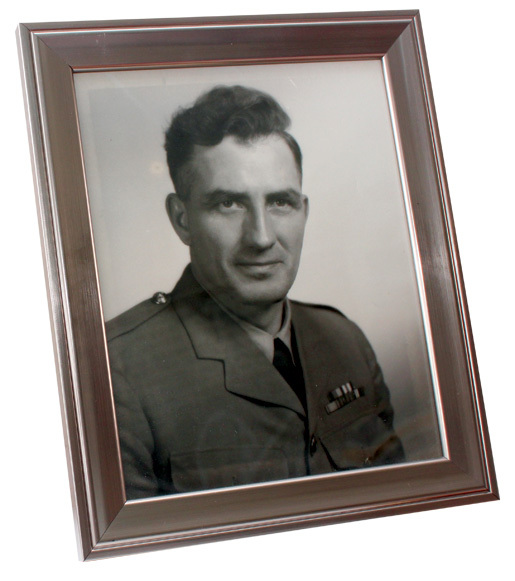 Benefitting from his acquired sense of direction is his partner, Diana Beaupré, who only recently changed her name from Baldwin to Beaupré after discovering a box hidden in her mother’s closet that revealed who her real father was: a French-Canadian soldier named Paul who met her mother during the Second World War while she was married to a Royal Air Force serviceman. A portrait of Paul Beaupré, Diana’s father. The personal nature of this wartime affair, which will be expanded upon later, is crucial to our little storyline as it intersects both life and death. It will show how a deep, dark secret spilled onto the floor and gave rise to a personal campaign to create a comprehensive ‘memorial’ to the 3,893 Canadian casualties sustained in the United Kingdom during the First World War. 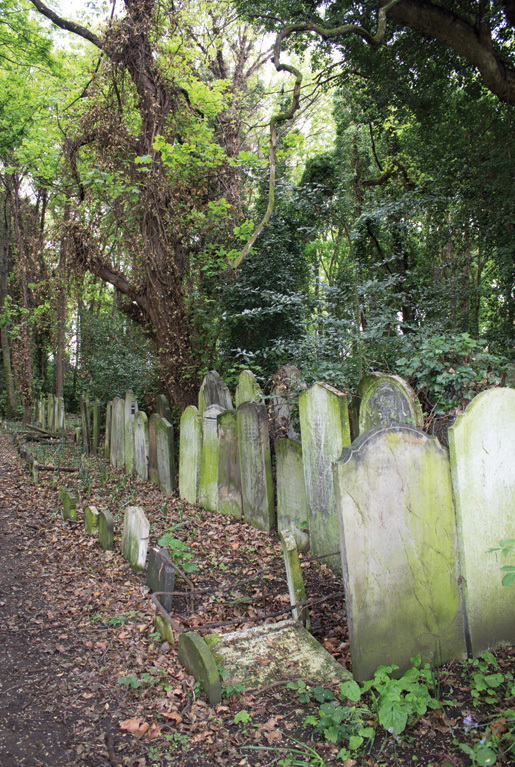 Large headstones fill a small part of Tower Hamlets Cemetery in London’s East End. Moving forward with the soothing voice of ‘Tim’ riding shotgun on a dash-mounted GPS, Adrian and Diana accept the built-in redundancy of a technology that could assist them on their morning adventure. Both Brits are approaching 70, but you would not know it from their energy—akin to a couple of teenagers en route to a splash park. Diana—a former self-employed dog groomer—and Adrian, who owned and operated a large boarding house for cats, burn brightly as they lay out the day that will unfold on the north side of the Thames. Indeed, if Diana’s ardour could be converted into sunlight, it would be radiating out of her eyes and fingertips. Such utility would certainly cast a welcoming light on how both of them spend most days—walking among graves and talking to dead people—or at least the spirits of dead people. The dead are mostly men—the majority in their 20s—buried in small to large cemeteries at some 853 locations in more than 88 counties and nine far-flung islands across the United Kingdom. Most of these soldiers and their graves are long forgotten, as are their families and stories of service. And some of them would still be a name on a memorial wall if Diana and Adrian hadn’t trudged through overgrown cemeteries to find and mark lost or hidden graves as part of their Far From Home project. 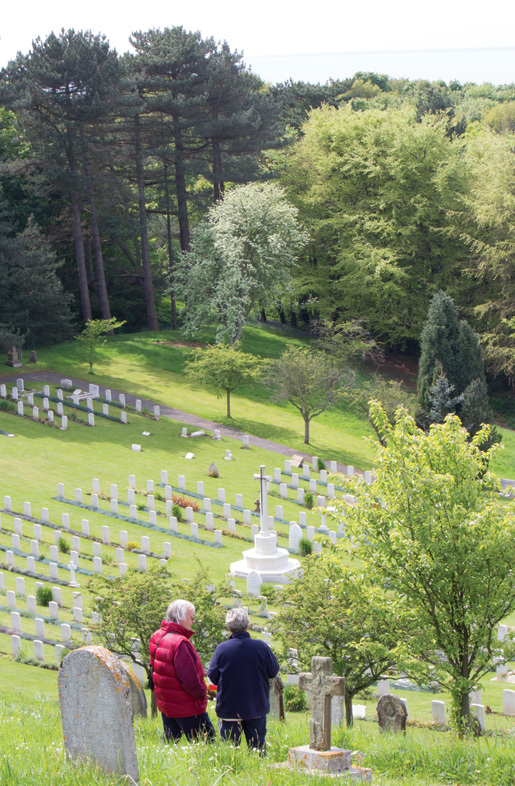 Their aim is to record—for posterity—all of the graves and as much as possible about the soldiers in them. 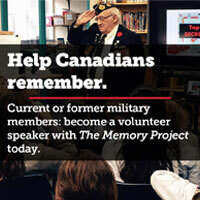 And while this volunteer work is amassing valuable information on Canada’s wartime experience in the U.K. it should give Canadian and British researchers—not to mention genealogists and the relatives of First World War servicemen—a more complete and personal narrative. For starters, it is a little known fact that some two-thirds of the Canadian Expeditionary Force (CEF) had immigrated to Canada from the British Isles before the war, which explains why so many of these men and 15 women are found in obscure churchyards and private cemeteries from Shorncliffe on the English Channel to the wind-swept Isles of Orkney off northern Scotland. Diana Beaupré and Adrian Watkinson make plans for an upcoming trip to Canadian graves in Scotland. As of mid-August, more than 3,500 graves throughout Britain and Northern Ireland have been visited. 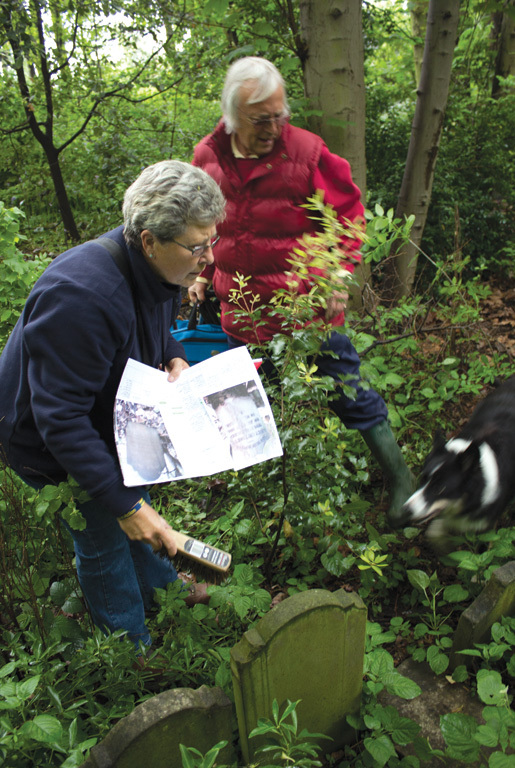 In 2012 alone, Diana—assisted by Canadian volunteer Lyette Brochu—visited 226 locations in England, Wales and Ireland. Next June the couple will embark on their sixth month-long road trip which will take them to 306 gravesites at 160 locations throughout Scotland. “It will take us 800 kilometres just to get to the Scottish border from Canterbury and we will be covering roughly 4,200 kilometres once we’re there,” explains Adrian. By the time the entire project is completed in 2016, the couple estimate they will have travelled—by car, plane and ferry—roughly 29,000 kilometres. “That’s a lot of petrol calls at £1.32 per litre,” he adds. To save time and money, Adrian maps out the best route, the location of entry points and the exact or probable location of a grave. 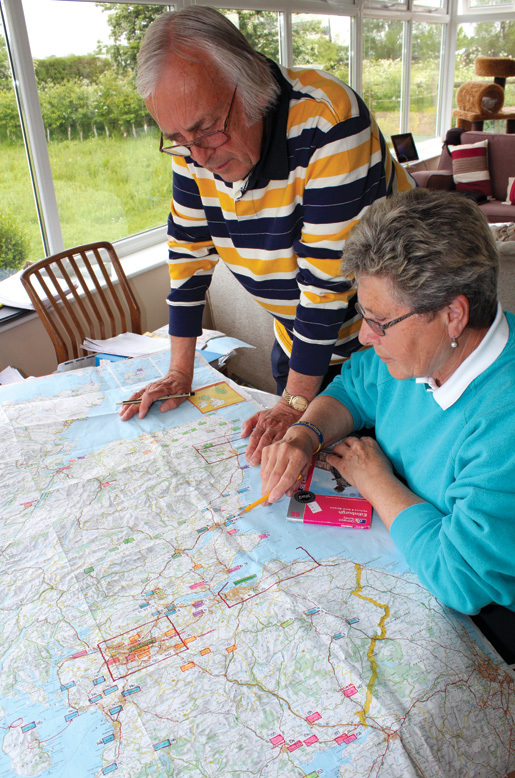 Whether it is a trip into London or a longer journey, each trip has its own ‘soldiers packs’ and ‘flight plan’ detailing who it is they are looking for and how to get there. Before planting a cross and a Canadian flag, Diana Beaupré and Adrian Watkinson say a few words for a soldier in a church yard cemetery. Diana gives the example of a grave belonging to Sapper Ernest Stigant of Winnipeg. Although born in the U.K., Stigant served with the Canadian Engineers and died in January 1918 from wounds received at the Battle of Vimy Ridge. Diana and Adrian had to cut their way through dense undergrowth in the municipal cemetery before they found the grave with a large tree growing through it. The work has produced an array of stats on everything from how Canadian soldiers died, how many were buried in a given year at a particular cemetery, marital status, religion, regiment, ethic origin and age at death. Beaupré and Watkinson—with the help of Ken Greenway’s dog Quinn—locate the grave of Private Frederick Ludeman at Tower Hamlets Cemetery. The profiles are compiled, regularly updated and then fed into volumes with each one assigned to a particular county. At last count there were 92 volumes in the couple’s “war room” situated in a cottage behind their modest bungalow near Canterbury. The binder for Kent/Shorncliffe, for example, contains 305 soldier profiles, all of whom died in the U.K. between 1915 and 1919. The highest number—112—died in 1916. Interestingly, the causes of death for the 305 were 29 by accident; 29 air raid; one at sea; 216 illness; 15 suicide; 15 wounds. The fatal accidents listed in the files include everything from falls to road mishaps to the discharge of firearms. Private Duncan McLean of Charlottetown, who had served in the South African War and enlisted in the CEF in 1915 at the age of 36, was struck by a truck. Private James Brown of Montreal died Aug. 24, 1915, after a train severed both feet and crushed both arms. Another soldier died after falling off a Martello Tower and breaking his back. This morning’s adventure in London’s East End could go that way. However, there is a strong sense of optimism in the car as they arrive and begin to zero in on the missing graves of Canadian Sergeant Joseph Clark and Private Frederick Ludeman. 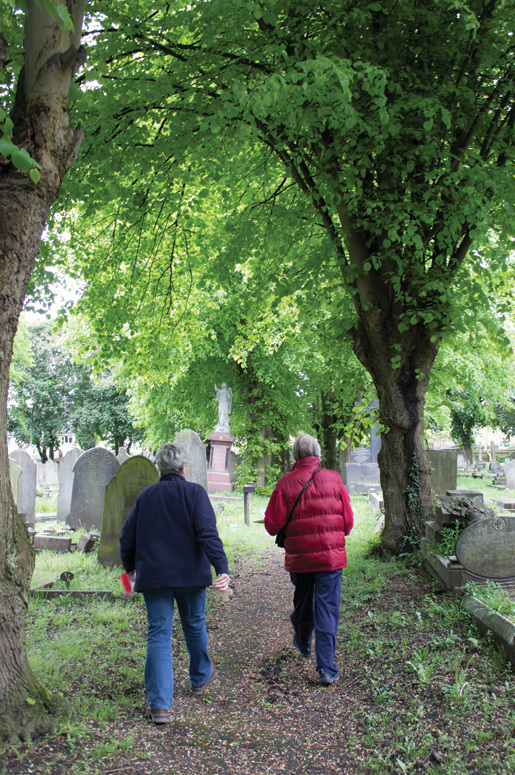 Hours of research has pointed them to Tower Hamlets Cemetery, one of London’s oldest and largest burial grounds. However, locating two missing and unmarked graves in the 33-acre cemetery won’t be as simple as walking in, grabbing the register and finding them by row and plot. Diana and Adrian have a strong ally in Ken Greenway who manages what for decades has been a closed cemetery within a nature reserve. In addition to Millionaires Row with its towering, vine-covered monuments, the ground at Tower Hamlets contains some 350,000 interments. As if on cue, a large crow settles on one of the water-stained monuments and begins to caw in the rain just as Ken, Diana and Adrian leave the main path and push beneath a dripping canopy of sycamore interspersed with ash and large London plane trees. The wet, uneven ground is a mixture of wild garlic, sweet violets, herb Robert and blue bells—just about everything you would associate with an English woodland. There are grave markers, too; all of them chipped and stained and leaning forward and aft like deteriorating teeth. Stretched across the top of one is a dead rat. The search continues for another grave—far from home. The search for Sergeant Clark takes Diana and Adrian into a more open, but equally crowded space. They know approximately where Clark’s grave is, but they can’t pinpoint it so they will have to return when there’s more time. 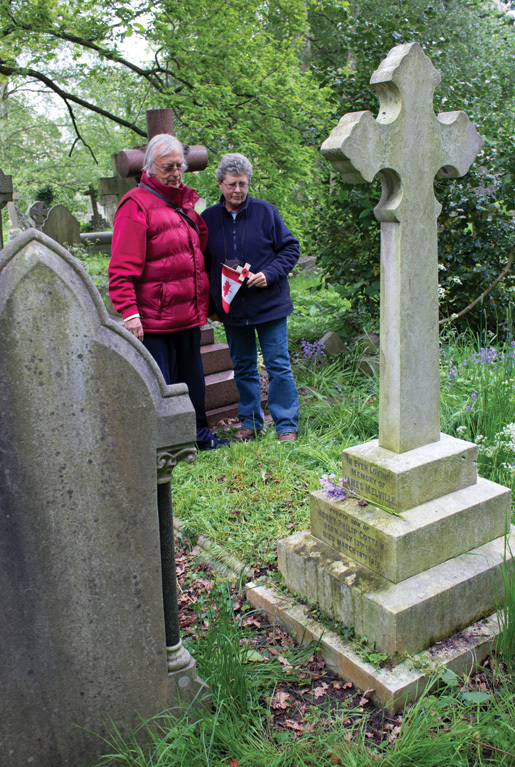 From Tower Hamlets, they travel to six other cemeteries where the work continues. It is evening by the time they return to Canterbury. I am looking for a grave of a Canadian soldier called Patrick Beauchamp, he was based in Surrey at the end of 1942 but sadly died after an accident on maneuvers at the end of that year. I have found Aime Beauchamp, but have come to a grinding halt. He was a little Native American and a good friend of our family having many adventures and outings in the year 1942. I have a few pictures with my uncle (who is now sadly deceased) but would like to know a little more and pay respect to his grave site. I have researched a lot but to no avail, any pointers would be very much appreciated.